On March 20, 2003, military forces from a coalition of nations led by the United States launched an invasion of Iraq. Code named by the U.S. military "Operation Iraqi Freedom," the invasion included 248,00 soldiers from the U.S., 45,000 British soldiers, 2,000 Australian soldiers and 194 Polish soldiers. Coalition forces also were complemented by an estimated 70,000 Kurdish Peshmerga soldiers in northern Iraq, who previously had been organized by operatives of the Central Intelligence Agency to form the northern front of the invasion against the Iraqi army. The invasion was commenced by the Bush Administration despite significant criticism from both within and outside the country questioning the justification and legality of the operation. On January 20, French Foreign Minister Dominique de Villepin declared that "we believe that military intervention would be the worst solution." Nelson Mandela also expressed his opposition in late January, stating "All that (Mr. Bush) wants is Iraqi oil." The U.S. Army's top general, Eric Shinseki, told the Senate Armed Services Committee that it would take "several hundred thousand soldiers" to secure Iraq, but his comments were promptly repudiated by Defense Secretary Donald Rumsfeld, who said that "the idea that it would take several hundred thousand U.S. forces is far from the mark." On February 5, Secretary of State Colin Powell appeared before the U.N. Security Council in an attempt to demonstrate that, despite its denials, Saddam Hussein’s Iraq possessed weapons of mass destruction and accordingly was in violation of the Council's Resolution 1441 unanimously approved in November 2002 offering Iraq a "final opportunity to comply with its disarmament obligations" which had been delineated in several previous resolutions. Powell warned that the U.N. Security Council would place itself "in danger of irrelevance" if it failed to endorse a U.S.-led invasion of Iraq. He went on to display blowups of satellite photos, claiming they showed “active chemical weapons bunkers” and trucks being used to conceal weapons materials. He also renewed allegations that Iraqi had a covert nuclear arms program, claiming that Iraq’s purchase of aluminum tubes indicated plans for their use as centrifuges for enriching uranium for nuclear weapons. Powell's assertions on Iraq's covert weapons programs came despite reports by Hans Blix, the head of the United Nations team investigating possible Iraqi sites of weapons of mass destruction pursuant to Resolution 1441, that "no evidence" of the prohibited sites or weapons had as yet been found. The immediate reaction to Powell's presentation was generally positive from key media and political sources; Senate Democrats such as Joseph Biden of Delaware and Diane Feinstein of California proclaimed that Powell had made a convincing case and others in the party either backed the Administration's position or publicly avoided substantial criticism. Any unified Democratic opposition to the use of force also had been undercut by the bi-partisan Congressional approval of a resolution in 2002, which was passed 77-23 in the Senate and 297-133 in the House, to "authorize President Bush to attack Iraq if Saddam Hussein refuses to give up weapons of mass destruction as required by U.N. resolutions." In addition to Biden and Feinstein, prominent Senate Democrats who voted for the resolution supporting military action included Hillary Clinton, John Kerry, Harry Reid and Charles Schumer. After giving Saddam Hussein an ultimatum to leave Iraq within 24 hours, President Bush notified Congress, as required by its 2002 resolution, that "diplomatic efforts have failed" and ordered that the invasion be initiated on March 20. Coalition forces initially seized strategic oil fields and ports, followed by thrusts inland to take airfields. Sporadic Iraqi resistance was encountered, but large numbers of Iraqi troops surrendered or deserted their positions. Some of the highest American casualties were suffered when a maintenance unit took a wrong turn and became trapped behind Iraqi lines near the city of Nasiriya, resulting in an attack in which eleven U.S. soldiers were killed. In another incident near Nasiriya, eighteen Marines were killed by friendly fire when a U.S. airstrike mistakenly targeted their position. On April 9, U.S. soldiers entered Baghdad, finding that Saddam Hussein and other top leaders had previously fled the city. 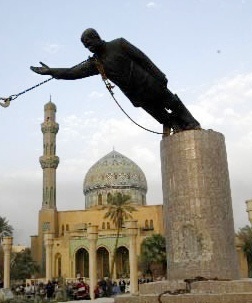 Less than a week later, U.S. Marines took Tikrit, Saddam Hussein's home town, effectively concluding the invasion. Searches for the key Iraqi officials would continue, with Hussein himself arrested some eight months later after found in an underground hideout at a home in a town near Tikrit. During the invasion, an estimated 9,200 Iraqi military were killed along with 3,750 civilian non-combatants. 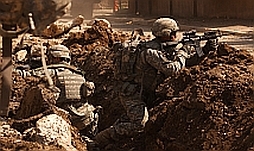 Coalition forces reported combat deaths of 139 U.S. and 33 British military personnel. Despite the military success, it soon became clear that the U.S. and its coalition partners had not developed effective plans for governing a post-war Iraq. Just two days after Baghdad fell, widespread looting broke out, including the theft of many rare objects in the Iraq National Museum. In other parts of the country, weapons and ammunition abandoned by the Iraqi military were seized by thieves or others resisting the occupation. Sunni Muslims, who long had been in control of Iraq, with Saddam Hussein only their most recent ruler, took up arms against Shiites, with both sides accused of attempting to take over neighborhoods and force out residents of the opposite sect. But in the weeks following his speech, attacks on coalition troops gradually increased, aided by weapons and ammunition hidden before or seized after the invasion. Insurgent tactics also began frequent use of improvised explosive devices (IEDs) hidden along roads used by coalition troops, which resulted in many casualties. Some three weeks after the President's "Mission Accomplished" speech, Paul Bremer, the special envoy Bush had named as the chief civilian administrator for Iraq, announced that he was ordering the disbanding of the Iraqi army, a decision which was made without consulting Secretary of State Powell and top military leaders. Bremer's abrupt dismissal of thousands of experienced officers and soldiers, many of whom soon joined the insurgency, was subsequently harshly criticized as strengthening the opposition to the occupation. Similarly, the purge of members of the former ruling Baath Party from government and public life also was later seen as unnecessarily generating additional opposition, as well as removing experienced administrators who had joined the party simply as a way to obtain jobs. As the occupation continued, Sunni and Shiite militias became increasingly well-armed and organized. Tensions between Arabs, Kurdish tensions also erupted in clashes, particularly in the northern city of Mosul and the in the oil city of Kirkuk. Criticism of the U.S. occupation grew following reports by Amnesty International, the Associated Press and the CBS program "Sixty Minutes" of widespread abuses of prisoners at the Abu Ghraib and other American prisons in Iraq. The continuing casualties and expense of the U.S. presence in Iraq evolved to become a significant political problem for President Bush. His job approval, which reached some 86 percent in the wake of the 9/11 attacks in 2001, dropped sharply to under 50 percent as he approached his re-election in 2004. Yet his Democratic opponent, Senator John Kerry of Massachusetts, who had voted for the 2002 Congressional resolution authorizing the use of force against Iraq, was unable to develop a persuasive position on how he would resolve the conflict. Bush won with 51% of the popular vote to Kerry's 48% and was elected with 286 to 252 votes in the Electoral College. By 2005, with the U.S. occupation still struggling to restore order, the Bush Administration oversaw a series of parliamentary and local elections in which Iraqis largely voted along ethnic and sectarian lines, resulting in control of the government by a conservative and religious Shiite coalition. The Shiite victories further inflamed the Sunni insurgency. 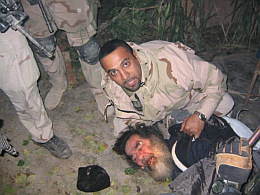 Saddam Hussein, although a secular dictator, was born a Sunni, and treated the Shiites brutally. It was only after his demise and the first democratic elections that Shiites came to rule the country. Prime Minister Nouri al-Maliki leads a Shia party and has formed a succession of Shia-dominated coalition governments. However, his continued refusal to incorporate Sunnis into the exercise of power is largely blamed for the current Sunni unrest. In the 2006 Congressional elections, Democratic victories in taking majority control of both houses of the Congress were attributed by many to growing public frustration with the Bush policies in Iraq. Soon after the election, President Bush accepted the resignation of Defense Secretary Donald Rumsfeld, who had been the target of many critics for the continuing disorder and violence in Iraq. In 2007, in the face of substantial political opposition, President Bush ordered a sharp increase in U.S. troop levels, acting on a proposal by General David H. Petraeus, the commander of American forces in Iraq. Labeled by the media as "the surge," the plan also included setting up small operating bases in the most violent neighborhoods in Baghdad, helping to reduce violence in those areas. In late April 2007, Congress passed a supplementary spending bill for Iraq that set a deadline for troop withdrawal but the President vetoed the bill, citing his concerns that "setting a deadline for withdrawal would demoralize the Iraqi people, would encourage killers across the broader Middle East and send a signal that America does not keep its commitment." ﻿﻿ After defeating Senator Clinton for the nomination, Senator Obama faced the Republican nominee Arizona Senator John McCain, a vocal supporter of the War, in the general election. Obama argued that the U.S. should shift its defense resources from Iraq to Afghanistan, which he viewed as the focus of the war on terrorism. He stated it was his intention as president to remove one or two brigades a month from Iraq, with all combat troops out within 16 months. In contrast, McCain declared that the U.S. should pursue victory in Iraq, and sharply criticized Obama’s timeline for withdrawal, arguing that military commanders should have the flexibility to decide when withdrawal would be possible. The significance of Iraq as an election issue, however, had been reduced by the sudden economic crisis that faced the country which began after the collapse in mid-September of Lehman Brother, along with subsequent concerns over the viability of the nation's largest banks and financial companies. After Obama's victory, post-election voter polls reported that the economy was cited by over 60 percent of voters as the most important issue, six times the percentage who felt Iraq was the major factor influencing their vote. On December 14, 2008, five weeks before he left office, President Bush signed a security pact with Iraq in his fourth and final trip to Iraq, which set a deadline of December 31, 2011, before which "all the United States Forces shall withdraw from all Iraqi territory." At the time of the agreement, U.S. troops in Iraq had been reduced to 146,000, approximately 20,000 less than the year before. Following President Obama's inauguration, he modified his proposed withdrawal schedule, and began negotiations with Iraq for maintaining a residual force of up to 10,000 U.S. soldiers to continue training and equipping the Iraqi soldiers, along with the terms under which the remaining U.S. forces would face in their stay. After the Iraqis failed to agree to provide immunity from trials in Iraqi courts for any U.S. troops accused of crimes, the President announced that in the absence of an agreement, he would withdraw all troops. The last U.S. soldiers left Iraq on December 18, 2011. After the U.S. withdrawal, Iraq continued to struggle to develop a stable government and to combat terrorist attacks. In June 2014, militias of the Islamic State of Iraq and Syria seized control of Mosul, Iraq's second largest city, along with wide expanses of other territory in a drive during which large contingents of the Iraqi Army reportedly fled their positions. As the ISIS advance threatened Baghdad, President Obama ordered the return of U.S. forces to provide intelligence, air strikes and other support for the Iraqi government to combat ISIS.